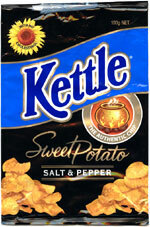 Taste test: Like the Spice variety of Kettle's sweet potato chips, these are an unusual but tasty chip. The flavor is not overpowering and is very similar to roast sweet potato  and that's never a bad thing! Two very enthusiastic thumbs up! Smell test: A light roasted aroma with a hint of sweet potato. 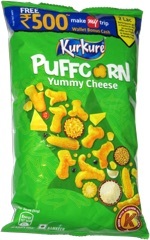 This snack was discovered by Mairéad Doolan. Review published .